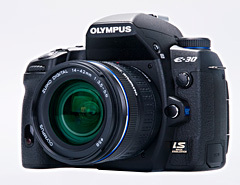 Macworld has just published my review of the Olympus E-30 DSLR. I think this is one of the best digital cameras Olympus has produced to date. It feels solid and professional, but isn't too heavy or bulky to stash in your backpack when on the go. The PROS are: Real-time focusing in Live View mode; support for multiple aspect ratios; image stabilization in camera body; unique features such as Multiple Exposure and Digital Leveler; 98 percent field of view through optical viewfinder; exposure bracketing in three or five frames. As for the CONS, I only had two: No movie mode; battery charger requires cord instead of plugging directly into wall outlet. I gave it rating of 4.5 mice. You can read the complete review of the Olympus E-30 here. I really like the camera. haven't read all directions yet. alot to read. the pictures i have taken have all turned out great. have 2 vacations coming up and can't wait to get great pix of the scenery.